I can tell what dogs are thinking by reading their facial expressions. This dog, for example, belongs to a friend’s sister. 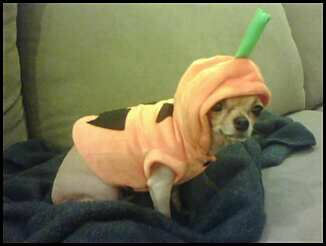 As you can see, they bought a pumpkin costume and put it on the dog. I went to your web site and fired up Danny Boy and the blues song at the same time. Have you tried that? I wonder if there’s any way you could do it in a live performance? We thought it was a rough patch, but it turned out to be our life.